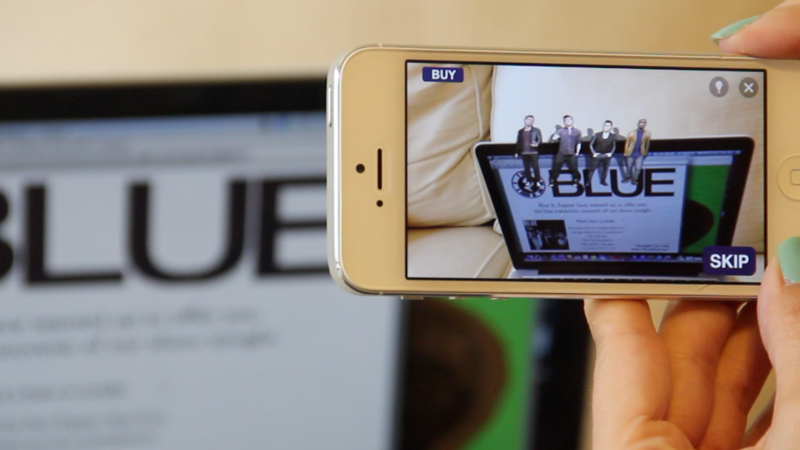 Print : Can These Augmented-Reality Apps Move Beyond the Gimmicks? Last week, a man jumped out of a bottle of Pepsi and performed a magic trick for me. No, I wasn’t hallucinating in the New York City heat wave. I was using an augmented-reality app on my iPhone that makes 3-D images and videos appear, through the phone’s camera, as though they’re on top of physical objects or environments. Augmented reality isn’t new in consumer apps. You might recall the buzz a few years ago around Yelp’s Monocle feature, or maybe you’ve heard of apps like Spyglass, which blend AR tech with the built-in GPS of a smartphone to offer interactive displays for outdoorsy types. But AR still hasn’t really had its “moment.” Now, with the introduction of Google Glass, which shows computational information on the lens in front of your eye, there’s an increasing interest in AR. This week, I’ve been using three different AR apps for mobile: Blippar, Zappar and Snaps. They’re all free to download, and are available on iOS and Android devices. 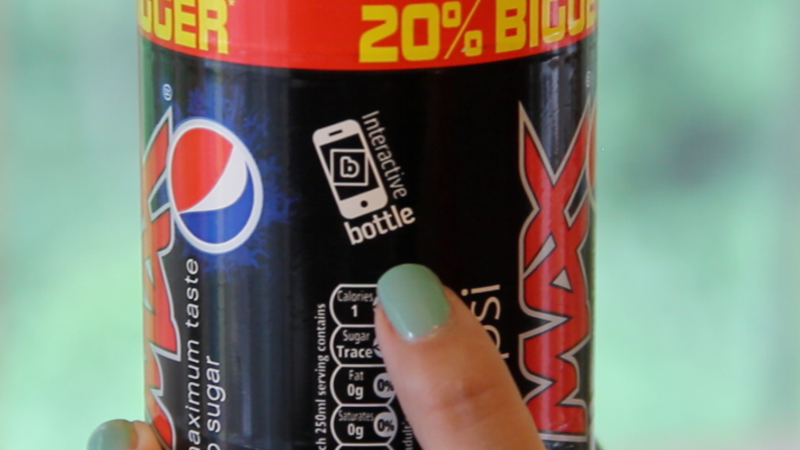 Blippar is also available on BlackBerry. 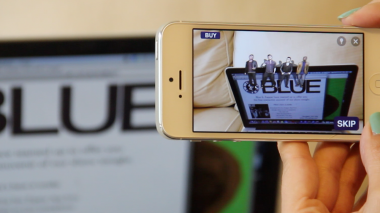 Blippar and Zappar are similar: With the app open, you point your smartphone at an AR-friendly ad, and a little video will appear in front of you. Snaps, on the other hand, layers fun images or text on top of smartphone photos as you’re taking them. I was curious whether apps like these would be stickier, or less gimmicky, than AR apps of the past. These apps are okay. They work as promised. They’re even fun. But they’re not apps I would use regularly. Right now, they’re centered mostly around advertising for big brands, rather than using AR to provide useful or contextual information such as search results, maps or local business information. And to get two of these three apps to work, you’ll have to find their logos in the wild, in places like magazine pages or in-store aisle promotions, which wasn’t always easy for me. That’s not something the app-makers themselves are necessarily responsible for: Big brands and companies control their digital ad campaigns, and determine what appears for the consumer when he or she scans an AR-friendly item. Several seconds later, a digital “B” appears on your phone’s screen. You tap that, and you’ve unlocked the interactive display. I scanned a bottle of Pepsi, a Heinz ketchup bottle and a Maybelline ad. Two of these had the Blippar “B” on them; the Heinz bottle did not, leading me to wonder how the heck someone would know to “blip” the bottle if the company hadn’t told them to. 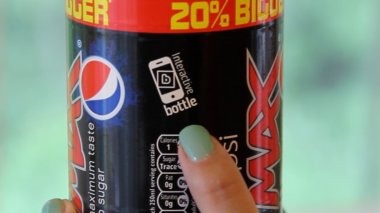 Through the “lens” of my iPhone, a video of a magic trick appeared on the Pepsi bottle. The Maybelline ad let me try on digital fingernail polish in different colors, by holding my own hand out and seeing how various colors would look on my fingernails. A digital recipe book appeared in front of the physical Heinz bottle, with the option to download recipes. This “B” signals that the object can be scanned using the Blippar AR app. About 25 percent of Blippar ads lead to some sort of e-commerce opportunity, according to the company’s founder. I experienced this with some fashion magazines, like Harper’s Bazaar. A purse would have a little “B” next to it, and, when I beamed it with my smartphone, I was taken to a shop page on the mobile Web. While I wouldn’t — or couldn’t — buy a $1,000 purse, I could at least appreciate that this “B” lead to an action, rather than just an animated purse dancing in front of me. Zappar and Blippar are similar in many ways: Zappar is used to scan physical objects with a little “Z,” which prompts an interactive experience on your phone. Zappar shows digital laser beams while it’s scanning the object, as opposed to the Blippar bubbles. With Zappar, I had a tougher time getting my hands on objects that I could try out, so the company sent me PDFs of posters and pictures of Zappar-friendly products. Two of the posters were for boy bands. I had never even heard of one of them, called Blue. (Maybe I’m too old for these apps.) In either case, when I scanned these static images using Zappar, virtual heartthrobs appeared on my phone, crooning one of their songs. A boy band I was too old to recognize popped up on my smartphone and sang to me when I scanned this poster with the Zappar app. I scanned an image of a floor mat that, presumably, would be on the shelf of a home-goods store or big-box retailer. A digital bunny rabbit jumped out on my phone’s screen and encouraged me to find six Easter eggs around the store, which I imagine would make “running errands with mom” a fun experience for kids. Lastly, there’s Snaps. 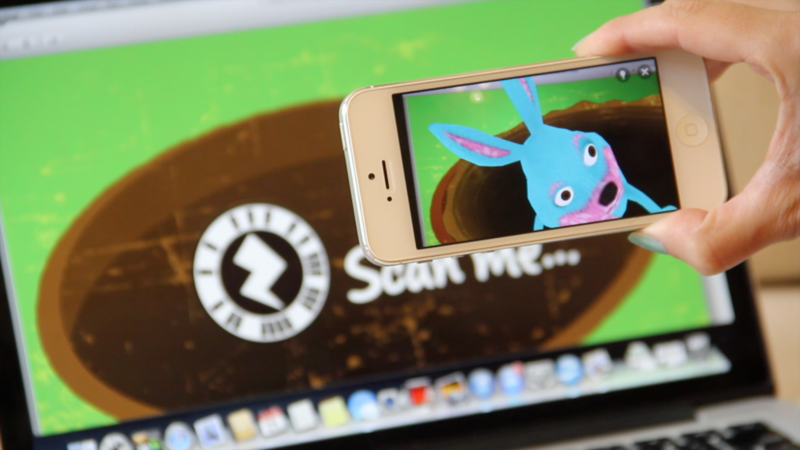 Unlike the other two, Snaps doesn’t “scan” images to create the interactive experience. Instead, it provides overlays that you slap on your photos for fun. These could be generic — stars in a night sky, or thick black mustaches — but many are also created by brands: TV shows like “The Voice,” “The Simpsons” and “Family Guy,” the new movies “Man of Steel” and “Despicable Me 2,” and even sports teams — the Knicks, the Red Sox — have branded overlays. After you’ve snapped a photo, it appears in an Instagram-like feed, and you can share it to your social networks. My favorite was a “Shark Week” overlay, pegged to the Discovery Channel’s week-long programming about sharks. I snapped a picture of a busy New York City street with an angry shark emerging from the pavement. 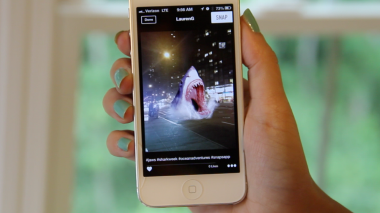 With the Snaps app, I could put a virtual shark, or other objects, into photos I was capturing with my smartphone. There are opportunities for coupons and discounts through Snaps — for example, you could receive a two-dollar coupon if you share a photo with an AR version of a Nestle product in it. And a current Blippar campaign with pop artist Ke$ha is teasing users with a potential pair of concert tickets if they “blipp” her logo or album cover. Zappar said that in a few weeks it is launching a product that will allow consumers to add AR tags to a multitude of objects — like a greeting card, to use one example — so that the user will have more control over what appears on their AR object. But these three apps are just a small sample of the many AR apps out there for mobile. Some AR tech is making its way into games, for a more immersive experience. Eventually, AR may be used for more utility-based applications — one AR developer told me that it could, possibly, create three-dimensional projections of objects, or replace the monitor on your desk by creating a computing experience on a glass plane. And Google Glass is just one example of how AR can work in technology that we wear on our bodies. 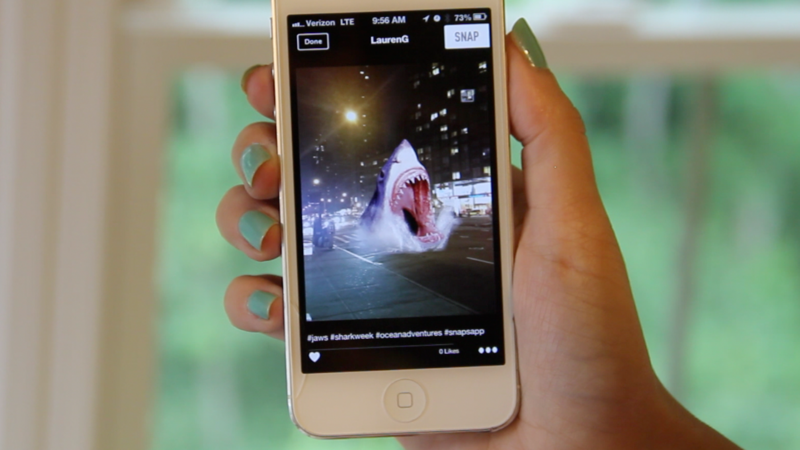 Sure, snap a picture with Snaps if you want to take a fun photo, or use Blippar to see a cool video or interactive ad. But just be forewarned that in their augmented world, it means more ads popping up in front of you — even more than they do now. 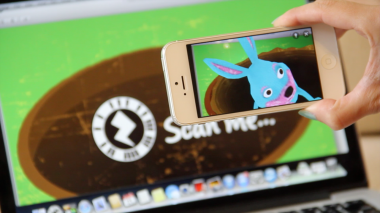 Return to: Can These Augmented-Reality Apps Move Beyond the Gimmicks?